There is something to be said for knowing where your food comes from. The origins can’t get any clearer than on a U Pick farm. As the name suggests, U Picks are farms where you pick your own produce right off the plants. It cuts out the middle man and allows you to choose as much or as little as you want. More importantly, everything is totally fresh. For my maiden “U Pick” visit, my girlfriend took me to Lee Turkey Farm, located in East Windsor, central New Jersey. Driving about 40 minutes west from the coastline, if felt strange to suddenly see farmland in the country’s most densely populated state, but there it was. Alongside Rte 95 we passed a dozen farms with signs claiming that they had the sweetest corn. Upon arrival, we checked in with the cashier. We paid a deposit of $5 per person all of which went towards the produce. 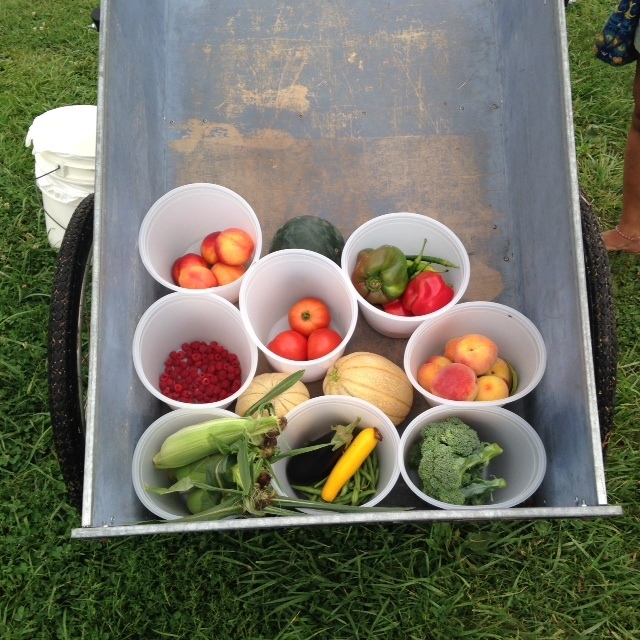 The next step was to (optional) grab a comically wide wheel barrel and/or buckets to collect goodies. One of the first things we passed were corn stalks which with us being the only visitors, conjured up images from Children of the Corn. But hey if you have to fight off creepy kids for “the sweetest corn” then it’s totally worth it. After the corn, came my favorite, the green beans. The bean stalks were only about a foot high but the fun was trying to spot them at first. Once you got “the vision” it got easier. I picked several things for the first time including watermelon, cantaloupe and raspberries straight from the bush. As for the corn, it was quite good though sadly, we only ended up having it week later – it plumped up well and was indeed fairly sweet. With the produce like green beans, I couldn’t tell a taste difference. The farm freshness was most noticeable in any type of fruit. The cantaloupe was vibrant and extra juicy. The nectarines and peaches were incredibly flavorful as well. It was a fun experience overall. The weather gods favored us and for a sum of $42-$15 (from the deposit) we got enough vegetables and fruits to last a week and a half. Picking the food also gave me an appreciation for the hard work put in by farmers and those that pick the produce. I highly recommend the experience. It is. Give it a try some time! Thanks for the comment.